I recently finished GM Walter Browne's The Stress of Chess ... and its Infinite Finesse ("My Life, Career and 101 Best Games"), which is his annotated games collection. You can see previous posts here related to GM Browne, including Annotated Game #1 (simul played in Las Vegas), Training quote of the day #12, Insights from GM Walter Browne and GM Walter Browne: 1949-2015. For chess improvement purposes, it's a great collection and perfect for using to go through a game during your lunchtime at work, which is how I worked through the book (and why it took so long to complete). I think it's useful for both your chess skill and overall brain health to have some quality chess study time, even if no more than 15-20 minutes, to break up the work day and get your mind thinking about something completely different. (Unless of course you're a chess professional, in which case for your brain health I'd recommend focusing on an activity that had nothing to do with it at all). I did the same thing with GM David Bronstein's Zurich International Chess Tournament, 1953 and will look for similar types of game collections in the future. I found Browne's annotations to be relatively short and succinct in words, yet always valuable and relevant. For chess improvers, another major benefit of going through a collection of a player's own annotated games is that you gain unique insight into their thought and decision-making process. Browne includes a lot of these types of observations and it's highly educational to see a top-level GM (which he was at his peak) provide casually sophisticated evaluations of positions and share the considerations he took into account when making choices on how to proceed at key points. As usually occurs when reading others' annotated games, sometimes you have to put some work into figuring out why a particular move is played (or not played) when it isn't explicitly explained or a variation given, but that's part of the value of engaging in effortful study - to grow in understanding by figuring things out for yourself. Also, as with almost any games collection, there are at least occasionally a few typos and such in the notation that force you to puzzle out the real continuation, but the editorial quality is high enough that these are no more than a very infrequent and temporary distraction. Browne's career was interesting in its ups and occasional downs, and spanned a long period of time in American chess. His personal observations about tournaments, opponents, particular controversies and so on are probably of more interest to those with some previous acquaintance with them, or just curious about tournament experiences in general. 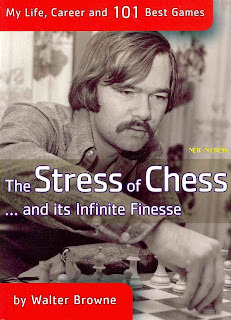 I don't think anything would be lost from a chess training perspective by skipping his sometimes encyclopedic accounts of his chess career, although there are some particularly entertaining stories from the decade where he competed the most internationally (roughly from the mid-1970s to mid-1980s). For those into the poker scene, he also towards the end of his book (and career) recounts some of his professional poker tournament experiences and has some interesting insights in that regard as well.